Lucky #13 is all the way from the UK by Amanda J.! Amanda says, "I chose to take part because I love crafting and am vegan. 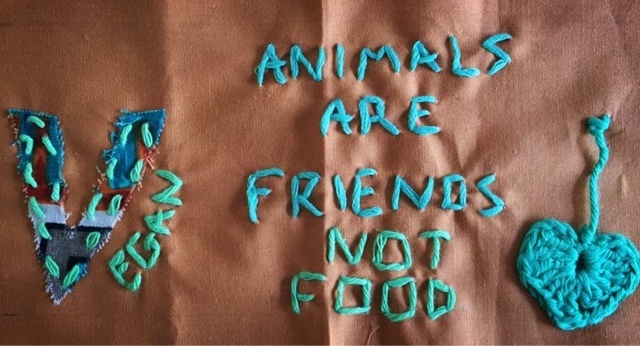 I recently found out about craftivism and thought it was a great idea to promote messages in a non-threatening way." 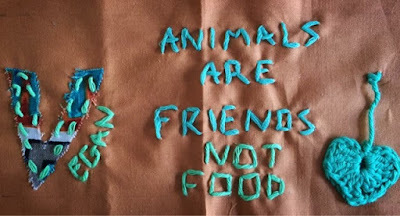 She adds, "my design says "Animals are friends not food" as I believe it is wrong to eat and cause pain to animals for human greed. Many people say they "love" animals yet continue to eat them. I am sending the message that if you really love animals, then you wouldn't eat them."